Ms. Celiac Says...: Beat The Heat With Bubbie's! Looking for a refreshing summer snack or dessert? Then I recommend trying Bubbie's Mochi Ice Cream! I was able to sample this gluten free treat at the Fancy Food Show in NYC last week! It comes in a wide variety of flavors including the chocolate espresso that I enjoyed! 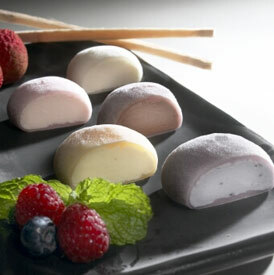 Bubbie's Mochi Ice Cream is all natural, gluten free, and kosher plus it is made in the USA! Bubbie's also has seasonal flavors including: Pumpkin, Peppermint Candy Cane, Chocolate Egg Nog, Mint Oreo, Honeydew and Cantaloupe. Bubbie's Mochi Ice Cream is available at Whole Foods stores throughout the United States. It has been featured on the "O" list in Oprah Magazine! For more information, please visit www.bubbiesicecream.com. What is the Kosher certificate? It is KSA - Dairy.